An image leaked on Reddit shows what is claimed to be an Oculus Go devkit. The picture also contains what could be the finalized retail packaging for the standalone VR headset. The box displays several apps that will come pre-installed on the device including Netflix, Facebook, Hulu and Ultrawings. Possibly even more exciting is the prospect that it will be compatible with over 1,000 apps, games and movies upon release. This number naturally includes almost all Gear VR apps, which Facebook said the Go would be compatible with when it launches. However, since it also includes “movies” in this total, it could be that most of it is watchable content rather than playable but we’ll have to see when it launches. What sets the Oculus Go apart from Samsung’s Gear VR is that it is a standalone device. Where the Gear VR requires one of a variety of compatible Samsung smartphones, the Go is fully self-contained. Keep in mind that the Go does not begin to compare to the Oculus Rift or any other VR headset powered by a PC so the experience will not be quite as good. Facebook did say that the Go would have a display that was of higher quality than the Rift. For one, the lenses used in the portable set are better than those in its big brother and significantly reduce glare. Additionally, the 2,560 x 1,440 LCD uses a “fast-switching” technology to eliminate lag between movements and the displayed image. It will also not suffer from the “screen-door effect,” Oculus VR boss Hugo Barra told TechRadar. 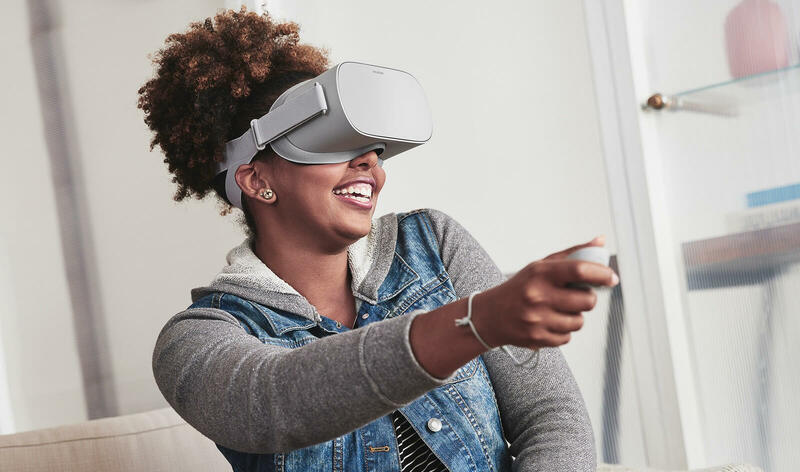 The Oculus Go still does not have a confirmed release date but Facebook has said that it will be out early this year. The base model will sell for $199 although the packaging seems to indicate there might be higher storage capacity models coming as well.